What impact do freezing temperatures have on TWO WAY Fillet®? We placed a TWO WAY Fillet® board and clamp in a deep freezer at minus 10 degrees for 15 days. After that time we removed it and dropped it 4 times from 7 feet onto a concrete floor. On the fifth drop the clamp hit the floor first. Neither the board nor clamp were damaged - they did not crack or break. The board was a bit stiffer than at normal room temperature, but for ice anglers this should be a great addition to your ice fishing gear. Fillet your fish before you leave the ice - inside your shack or shelter, or right on the ice. We do not recommend storing your TWO WAY Fillet® below zero for extended periods of time. Are your clamp springs stainless steel? TWO WAY Fillet® clamp springs are made from piano wire, then coated with a rust resistant process of Zinc plating. Is there a warranty on TWO WAY Fillet®? TWO WAY Fillet® board and clamp are warranted against material defects and breakage during normal usage, for one year from date of purchase. With proper explanation and upon return to us we will repair or replace your broken part and return it shipped at our expense. You say your product is USA made? All parts and materials have been purchased from USA companies. R&D Leverage, Lees Summit Missouri,designed and made our injection molds. R&D LEverage also made our sample products and first production run. They have been great to work with. Our springs are custom made by ISC in North Kansas City, MO. What is TWO WAY Fillet® clamp made from? Your TWO WAY Fillet® clamp arms are made from ABS plastic. This was chosen because of its strength and ability to flex slightly so that the clamp will last a long time and withstand insertion into the board many times. The clamp includes a spring made from piano wire and heat coated with a zinc plate which means it will resist rust. The nut and bolt are made from Nylon and of course will not rust. What is TWO WAY Fillet® fillet board made from? TWO WAY Fillet® Fillet board is made from FDA approved plastic. 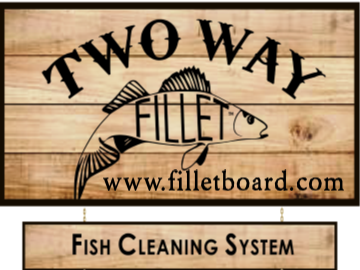 This means that your fish cleaning system can be cleaned with soap and water, and will not dull your knife edge as much as other surfaces. The plastic used is Polypropylene.